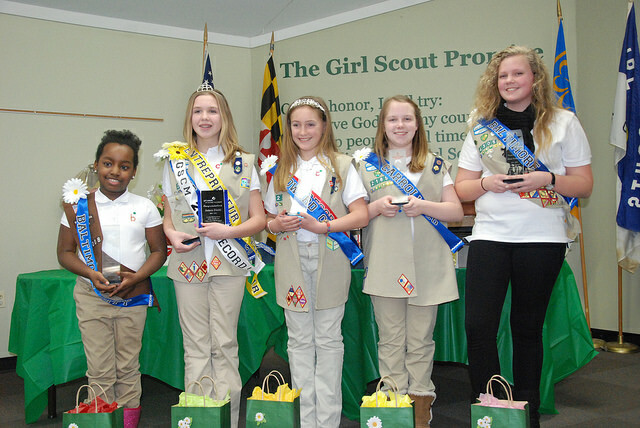 Glen Burnie Girl Scout, Jenna Diehl, was crowned the Cookie Entrepreneur of the Year after selling a record-breaking 5,058 boxes of cookies, surpassing all other top-sellers in the Girl Scouts of Central Maryland. The previous record was set by Cadette Girl Scout, Morgan Stolba, from Howard County. Jenna had been a member of the GSCM 1,000+ Club — a club established for Girl Scouts selling 1,000 or more boxes of cookies during the three month cookie sale — for three years before achieving the goal of selling the most cookies in the Council. In addition to being a phenomenal cookie seller, Jenna is an honor roll student, plays both sports and musical instruments, and belongs to the Girl Scout Chorus, Girl Scout Travel Club, and Caitlin’s Outdoor Adventures. Jenna truly demonstrates the ways in which the Girl Scout program develops leadership skills in girls. Jenna is definitely a leader. Congratulations to all of our Cookie Entrepreneurs!